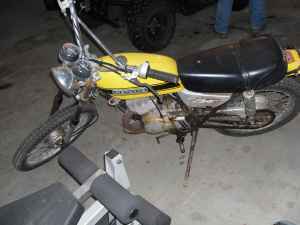 The 1970 suzuki 125 for sale has a yellow paint color and when you see it you will see that this is a very nice old Suzuki motorcycle that runs good! If you have questions or would like to make an appointment for payment and pick up you can reach me by emailing me using the space below that has been provided by Strike Lightning Motorcycles for Sale (and PLEASE do not neglect to include your contact information in your email or to provide a phone number or email address if you leave a message!) so that I can respond with answers to your questions as quickly as possible. You just don't find that many nice, old Suzuki motorcycles for sale on Minnesota's Craigslist or Ebay so hurry and make an offer before this one gets away from you! Strike Lightning would also encourage bikers to submit a review of the 1970 Suzuki 125 for Sale to make the biker community aware of any problems that are common to the 1970 model Suzuki or to highlight its positive features and help potential buyers make informed decisions. Join in and write your own page! It's easy to do. How? Simply click here to return to SUZUKI AD INVITATION.